After "overnight" stardom in a megahit like Raiders of the Lost Ark most actresses would try to cash in, and campaign to appear in the sequel. 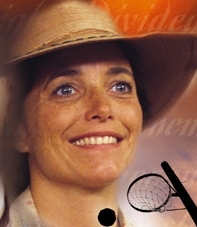 Allen did neither, after making a major impression as tough-talking Marion Ravenwood opposite Harrison Ford, preferring to focus on stage work and choose her film roles carefully. Her first movie, The Whidjitmaker (1976), went totally unnoticed-as did she. Two years later, she played a likable coed and the voice of reason in the rowdy-frat-boy epic, National Lampoon's Animal House (1978), which won her a small but loyal following. Her best screen opportunities have come in The Wanderers (1979), Cruising (1980), and particularly Starman though her own starring vehicle Until September (both 1984) was a disappointment. She had a small role as a social worker in Malcolm X (1992). An actress who projects intelligence and warmth, Allen was costar of the 1994 series "The Road Home."